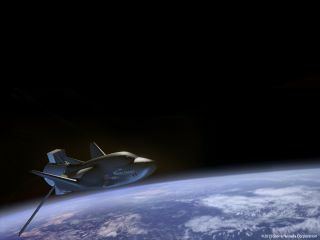 Artist’s illustration of Sierra Nevada's Dream Chaser space plane in Earth orbit. A private space plane is set to fly the United Nations' first-ever space mission five years from now. Sierra Nevada Corporation (SNC) and the United Nations Office for Outer Space Affairs (UNOOSA) are teaming up to launch a two-week robotic mission to low-Earth orbit in 2021 using the company's Dream Chaser spacecraft, representatives of both organizations announced Tuesday (Sept. 27). "One of UNOOSA's core responsibilities is to promote international cooperation in the peaceful use of outer space," UNOOSA Director Simonetta Di Pippo said in a statement. "I am proud to say that one of the ways UNOOSA will achieve this, in cooperation with our partner SNC, is by dedicating an entire microgravity mission to United Nations member states, many of which do not have the infrastructure or financial backing to have a stand-alone space program," she added. The 2021 mission is targeted primarily at developing nations, but any U.N. member states can apply to put a payload on board. Nations whose experiments are chosen will be asked to foot part of the mission's total bill, though poorer countries will likely receive a price break, Sierra Nevada representatives said. UNOOSA and Sierra Nevada are also looking for sponsors to help fund the mission. Over the next year, the two organizations will hash out details of the mission, which "will provide United Nations member states with the ability to access space in a cost-effective and collaborative manner within a few short years," Di Pippo said. "The possibilities are endless." The 30-foot-long (9 meters) Dream Chaser looks like a much smaller version of NASA's now-retired space shuttle orbiter. Like the space shuttle, Dream Chaser launches vertically, lands horizontally on a runway and is reusable. Dream Chaser can carry up to seven passengers, but it's also a cargo-hauling craft; indeed, NASA recently selected the uncrewed version of Dream Chaser to provide resupply and trash-disposal services to the International Space Station.